How many of you use the adsense widgets from blogger?? Most of the bloggers create therir own custom ad units and paste the html code in the blogger template or add it as an HTML template.All of you guys know that you can also add adsense from blogger. Now here is the important part.. When you create custom adsense units at Adsense you tend to create channels and you make make so many channels and finally get confused with them.. Consider that there are different chanelled adsense ads on your blog. You can still know the total income that your blog generated(Sum of al the ad units on your blog). Goto your Blogs DashBoard and choose the Monetize tab. You will see something like this if you are there for the first time. Now Choose for Customize Ads and you will be taken to a new page. If you are using custom adsense code generated from the adsense site then opt the last option in this new page as shown in this screen shot. Also your blog as a whole will be displayed as a channel on reports at the Adsense Site. 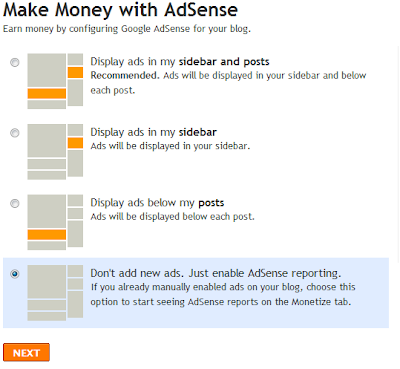 This helps you to keep track of your adsense revenue from you blogger dashboard. Thanks right, i can't get the content from google adsense in my blog. couse google adsense can make adnsense for content from my country. @Thesoul i didn't understand wht you told. can you explain? yah sorry, i come indonesia, but my englihs not perfect. Its another way of keep tracking my adsense income on all about Auto Zone, thanks for the info. I want to add different lables under different pages But How? Why my account does not appoved. "Your AdSense account has been disapproved"
I installed a custom adsense code under the title of the article with tricks parse, if this does not violate the TOS?, and 3 others using the blogger via adsense Monetize tab. But, two days later adsense via Monetize tab no longer appear on my blog, would you give me a solution? this is my blog URL http://dvbfrequencies.blogspot.com . By the way, I like your blog, Thank's. i am also having a blog and i want to tell you that i have heard that if u want to join google adsense from india before 6 months so then u have to remove .blogspot from domain, i dont know that they are wrong or right, same thing happened to me but next month i will send the request to them again hope they will approve ! @!